As the lights slowly dim, the crowd begins to buzz in anticipation for the final act of the evening . Performers for the Andrew WK concert soon start trickling onto the stage in what is sure to be a memorable end to another successful year for the team of the Acting Out! Festival. The Acting Out! Festival was created by Derek Hess, his long-time business agent, Marty Geramita and their marketing expert, Angie Hetrick. Meant to break down the stigma of mental health and addiction, they created this event in order to help people get the resources they need if they are struggling. Breaking the event into four days — running from Sept. 13-16 — allowed them to give guests the opportunity to pick and choose the events they wanted to see. According to Geramita, they wanted to give people an event that not only has a lot of testimonials, but music and other activities to attend. Since everyone’s journey to recovery is different, having a variety of events is something important to the Acting Out! team. With the event spanning four days, this gave the Acting Out! team a chance to create events and work with people who are really passionate about spreading awareness of mental health and addiction. According to Geramita, they wanted an event that was entertaining because it can sometimes be difficult for people to talk about mental health and addiction. The programs include art exhibits, live music, stand-up comedy, film and panel discussions. While the entertainment aspect was important to help reach a wider audience and get a conversation going — the resources at the festival is what really helps the guests. According to Geramita, the festival covers all of the bases as far as resources go to ensure that they can help people if they came in looking for them. During the festival this year and last, people have come in looking for help because they were struggling and according to Geramita, they were able to point them in the direction of a doctor or a counselor. “We have resources, whatever issue you have, we have someone that can help you,” Geramita said. Support and having an event like this is something Nick Hartkop, member of Cleveland-based band McCafferty, feels very strongly about. With his own history of struggling with mental health, Hartkop believes that an event like this is can be beneficial for everyone involved. Talking about depression and suicide is not easy. Hartkop feels that bringing awareness and breaking down barriers could be beneficial, especially for people who are younger. The stigma of mental health and addiction can be negative and for people who are struggling — especially for younger people — it can be hard to try and find help. Hartkop admits that he even had a difficult time accepting he had a problem. By having this event, Hartkop feels like it can normalize talking about mental health. “Events like this are so important and I think that high school, college and people outside need to be targeted,” Hartkop said. Going to an event like the festival can be beneficial and with students attending, these events can be a great way to give individuals the ability to talk about their struggles. Katharine Oh, the director of Cleveland State’s Counseling Center, likes the idea of an event like this and encourages students to go to it. One of Oh’s main points was the fact that an event like this could inspire students to talk about mental illness. Oh believes that having fairs and awareness events could be helpful because this can allow students to talk about what’s happening in their lives. By spreading awareness and normalizing these struggles, it can not only make students feel that it is okay to get help if they are struggling, but there’s a possibility it could also motivate students to talk with one another, something Oh has noticed in recent years. 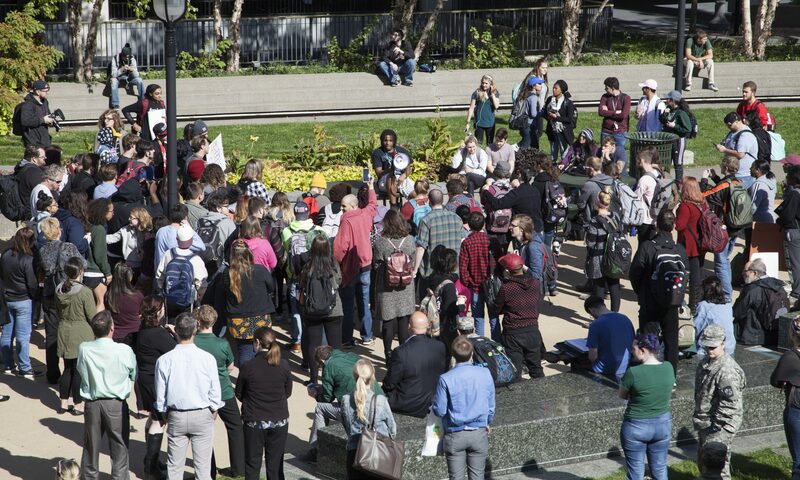 According to Oh, Cleveland State students have a tendency to tough out their problems and Oh encourages students to talk about mental illness and watch out for their networks and connections in case someone is having a difficult time. For the members of the Acting Out team, this is something that they have dedicated a lot of their time and energy to. Helping people find the resources they need is the most important thing for Geramita and the rest of the people involved with the Acting Out Festival.